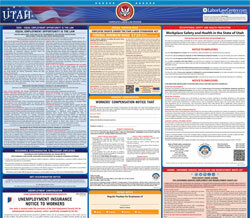 The Unemployment Insurance Notice to Workers is an unemployment law poster by the Utah Labor Commission. This is a mandatory posting for all employers in Utah, and businesses who fail to comply may be subject to fines or sanctions. This poster must be posted in a conspicuous place by all employers so that all employees can see it. This poster describes how to qualify for unemployment, how the amount of unemployment paid is determined, where to file a claim for unemployment insurance benefits, and important information that employers need to know. It appears you don't have a PDF plugin for this browser. Please see the link below to download utah-09-22e.pdf. unemployment insurance purposes, unless specifically exempted by the Act. economic need. The funds to pay unemployment benefits are paid by your employer. No deductions are made from your wages. file your claim. You should, therefore, file immediately after becoming unemployed or when your work hours are reduced to less than full-time. ness, you must file a claim for unemployment benefits within 90 DAYS of your doctor’s release to full time work. notice to file a claim. Both you and your employer will be requested to provide statements explaining the reason for your separation. for others, maintain proper accounting records and business reports, pay self-employment taxes, and provide for insurance. es include job referrals, career counseling, workshops, employer recruitment, Veterans’ services, labor market information, and job training/internships. accessing services and resources. Fax and copy machines are also available. wages and separation information on all workers for at least four (4) calendar years. proper determination of status can be made. By doing this, you may avoid unpaid contributions (tax) liabilities, interest, and penalties. Additional information is available in the “Employer Handbook” which you can access on the Internet at jobs.utah.gov/employer. letin boards, near time clocks, etc.) in each work place and establishment.